Introduction: The dental treatment in the Bolivian highlands is challenging. Due to the reduced infrastructure, the caries prevalence of the local population is heavily increased. Objective: The aim of this pilot study was to investigate the general oral health situation of dental patients in a rural region of Bolivia. Material and Method: 174 patients were included in this pilot study (age 24.64 ± 16.42 years, range 3 to 80 years; 65.36% female patients). Patients were treated in a dental office in Huancarani (operated by the FCSM). Patients lived in four different corporations. dmft-Index (0-6 years) and DMFT-Index, edentulousness situation, nutrition habits, and socio-economic factors were collected. Results: The dmft-Index of the treated patients was 7.00. The DMFT-Index results in 8.02. 37.94% of the patients suffered from general dental plaque, and 60.34% showed isolated dental plaque. In 1.72% of the investigated patients, no dental plaque was detectable. 35.63% of the patients knew oral hygiene products. 4.02% of the study participants required treatment for an acute malocclusion. In 2.8% of the included patients, parasitoses (South American trypanosomiasis) were verified anamnestically. Discussion and Conclusion: The oral health situation of the patients showed a massive restorative and prosthetic treatment demand. In addition, education on sufficient oral health and the dissemination of oral health products have to be pushed. The prevalence of South American trypanosomiasis, which can lead to death especially for children, can be assumed to comprise a considerable number of undetected cases. The main goal of further studies must be the development of interdisciplinary infection prophylaxis and oral health prophylaxis systems. Fluoride exposure in the course of daily dental care can interfere severely with the galvanic corrosion behaviour of implant materials. The dynamics of the response to a spontaneous fluoride exposure are particularly interesting. To investigate these dynamics, the response of two electrochemical couplings - Ti/Ti and Ti/CoCrMo - to the addition of various fluoride concentrations was recorded via electrochemical noise measurements. Both a neutral and an acid environment were considered. Later, an optical surface analysis and a determination of the mass loss of the samples were performed. While Ti/CoCrMo was not affected in its electrochemical behaviour, Ti/Ti did respond to a fluoride exposure. Depending on the pH and fluoride concentration, the reaction varied from temporary deterioration of the passivation layer with subsequent repassivation to active corrosion paired with significant mass loss of the samples. In conclusion, high fluoride concentrations and low pH should be avoided for the electrochemical coupling Ti/Ti, especially in the context of long-term exposure. In contrast, the coupling Ti/CoCrMo proved to be extremely resistant to fluorides in terms of its galvanic corrosion behaviour. Introduction: Transmission of infectious diseases carries high risks for patients and dental professionals. Prosthetic work pieces have to be disinfected. To date, there are no specific disinfection products available for the one-shot disinfection process. Instead, universal disinfectants are used. Objective: The aim of this study was to investigate the influence of chemical disinfectants in the one-shot disinfection process on material-mechanical parameters of several denture base resins. Material and Method: 252 test specimens from four acrylic denture base resins (PalaXpress, Paladon 65, Futura Gen, FuturAcryl 2000) were produced. Test specimens were constructed prismatically according to DIN-EU-ISO 3167. Three chemical disinfecting agents were investigated (Impresept, D50 Instru-Gen, Stammopour DR). Specimens were stored in distilled water and divided into five test groups (2xcotrol, 3xtest). E-Modulus and flexural strength were detected using the three-point bending test. Results: There was no significant influence of the disinfection agents on the E-modulus detectable ((PMMA vs. distilled water from (Futura Gen) 2688.80 ± 230.78 vs. 2766.60 ± 91.22 MPa,p=0.847 to (PalaXpress) 3004.20 ± 26.40 vs. 2851.00 ± 95.23 MPa, p<0.001). In determination of the flexural strength after storage in distilled water, no significant difference was measurable (PMMA vs. distilled water from (Paladon65) 27.28 ± 1.30 vs. 28.42 ± 0.84 N/mm2, p=0.216 to (PalaXpress) 30.88 ± 0.25 vs. 29.68 ± 0.79 N/mm2, p<0.001). Discussion and Conclusion: After storage in distilled water and subsequent one-shot disinfection, there was no significant influence of the E-modulus and flexural strength detectable compared to the specific standard test specimen. For avoiding cross-infections and standardising of working processes, one-shot disinfections are feasible for acrylic dentures. Despite modern therapies, the 5-year survival of patients with an intraoral squamous cell carcinoma (PECA) remains poor at 50%. The most important prognostic factors are the tumour size and the presence of lymph node metastases (CM) at the time of initial diagnosis and the development of a relapse during the follow-up. With regard to the relapse behavior, there are few data, making early detection in tumour aftercare extremely difficult. This is also reflected in a low level of evidence for the approach in tumour aftercare in the German guideline. 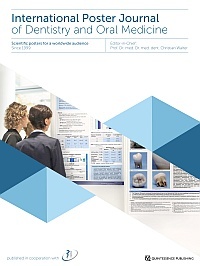 Retrospectively, over the years 2000-2014, the oral and maxillofacial surgery patients at the University Medical Center Mainz who developed a primary intraoral PECA and were treated in domo were re-examined. In addition to studying the epidemiological data, the risk factors and the TNM-status, the focus was on the relapse behaviour and types as well as the influencing factors and the diagnosis. Overall, 766 patients (34% women and 66% men) were compared at a mean age of 62 ± 13 years. Due to the high number of T3-4 tumours (33%) and the high rate of lymph node metastases (37%), 50% of patients already had an advanced tumour stage (III-IV). Here, 70% developed a relapse within the first 2 years, with a median of 12 months within the examined group of people. The most common type of relapse was a local recurrence, with 36%. 55% of the relapses were diagnosed using a clinical investigation method. The presence of poorly differentiated tumours and the existence of lymph node metastasis were statistically significantly more often accompanied by the development of a recurrence. An advanced tumor stage, the presence of lymph node metastasis, and relapses are typically associated with a worse 10-year survival. Thus it can be concluded that intraoral PECA recurs particularly often in the presence of cervical metastases and an undifferentiated tumour . These data reinforce the absolute necessity of a close-knit clinical follow-up, especially during the first 2 years, which should go beyond the recommended guidelines in a three-month rhythm to detect the relapse in a timely manner. The aim of this study was to determine the success of psychotherapeutic treatment for dental phobia by measurement of anxiety using the dental anxiety score (DAS), the state trait anxiety score (STAI state), salivary cortisol and protein concentrations and the salivary secretion rate. The primary endpoint of the study was the comparison of the data before and after psychotherapeutic treatment. Forty patients were included in the study. 24 were allocated to the phobic group and 16 to the control group. Saliva was collected upon entering the dental clinic and again after three weeks of psychotherapy. The results were compared with those of a control group. The DAS and STAI questionnaires were completed at each visit. A significant reduction in DAS values was found after psychotherapy. However, the values remained significantly higher in the phobic group than in the controls. Similar results were found for STAI scores. A higher salivary cortisol level was found in the phobic group. No changes occurred in cortisol or protein concentrations. The salivary secretion rate increased in the phobic patients after psychotherapy. It could be concluded that psychotherapy is effective in the treatment of dental phobic patients, thus improving oral health. During tooth development odontoblasts embed growth factors in the dentin matrix, where their potential for biochemical signaling is preserved. They can be liberated later by demineralising agents and might influence immune response as well as the behavior of pulp cells. The aim of this study was to investigate the impact of dentin matrix proteins (DMPs) on the migration, viability and mineralisation of human dental pulp cells. At first, a complex procedure to isolate, purify and concentrate DMPs (up to 80,000 pg/ml TGF-β1) from human dentin was established. DMPs were utilised at different concentrations in a modified Boyden chamber assay to investigate chemotactic effects on pulp cells after 24 hours. Viability was analysed by MTT testing over a period of 14 days, and alizarin staining after 21 days provided information on the induction of mineralisation. DMPs showed a concentration-dependent chemotactic effect on human pulp cells and were able to influence their metabolic activity. Furthermore, they induced mineralisation that indicated cellular differentiation. These investigations show the potential of endogenous signaling molecules from human dentin to influence viability and enhance the migration as well as differentiation of pulp cells. The release of DMPs, which is easy to achieve in the clinic through the superficial demineralisation of dentin, might optimise procedures in vital pulp therapy as well as in regenerative endodontics in the near future.